I recently attended the above conference, which was organised as part of Chelsea’s Borderline Programme, aiming to discuss pertinent questions on the idea of borders and visions for future Europe in relation to ideas such as cross-cultural, trans-national and diasporic experiences. Raimi Gbadamosi’s introduction presented the idea of borders in Europe as something to be reconsidered. As Scotland wishes to separate, and Turkey is waiting to enter EU, European nations try to hold themselves together. Although, as he explained, the question of Turkey within EU upsets the self-assured notion of nationhood of European countries, at the same time within Europe immigrants and asylum seekers exist as a separate state – an imagined 28th state. Curator Shaheen Merali spoke on the institutionalization of ideas and culture and the programmed/constructed notion of nationhood. As example he referred to Chinese artists Cai Yuan and JJXi’s intervention-performance of jumping up and down on Tracey Emin’s bed and the reaction of both gallery guards and press trying to protect the Britishness and collective esteem invested on a Turkish-British artist’s work. He argued that the performance signified breaking boundaries of institutionalized order at the same time recognizing through the event the notion of difference. Artist Margareta Kern informed of her project in Berlin, supported by the Arts Council of England, engaging guestworkers (gastarbeiters) who had been invited by Germany after the Second World War. Her research addresses questions of politics as well as constructing a narrative for their lives. Guestworkers existed in Germany by forming their own individual ethnic communities. This, in turn, created different ethnic borders within the German territory. Kern explained that the enforcement of this country’s national borders contributed to the peripherylisation of part of its world and designated foreign workers as a labour service. The two originators of European Alternatives/euroalter spoke in anonymity, and in dialogue with each other, about the need to abolish European borders. They argued that with transnationalism, the analogy of a border is “beyond geographical democracy”. “Borders are no longer important”. In support of immigrants they argued that European economic supremacy depended on their exploitation. Migrant groups within Europe are establishing an autonomy and different kind of borders. As example, they referred to Athens segregation where illegal immigrants, connected to drugs, arms sales and prostitution, had created a city within a city. Open borders and free immigration appear to summarise the new idea of democracy. Lorenzo Marsili and Niccolo Milanese argued, “we must stop speaking and start acting”. As “tension changes people’s minds”, “we must get out there, do things differently and fix the world”. Reflecting upon the euroalter example of Athens, information on the web tells us about terrorist atrocities which occurred in the city last December, where Athens was “fixed” by being burned down. Such activity has been, and still is, virtually orchestrated in Athens on the web by Indymedia. It is organized by both local and foreign, left and anti-racist organisations, recruiting school children and illegal immigrants to their cause, directing them in terrorist actions against the local population – immigrants being exploited yet again, but in a different way. As for democracy, this must be one of the most misused words in modern vocabulary. Art curator Elvira Djangali spoke from the point of view of people in diaspora and on the question of belonging. For her the innocent question, “where do you come from” is a way of differentiating the indigenous subject from the foreign other. She argued that the illusion of home being everywhere, is that home is nowhere. Making borders mist, is how to keep our being in a place of memory. Holding on to an identity, is the only way of crossing borders. 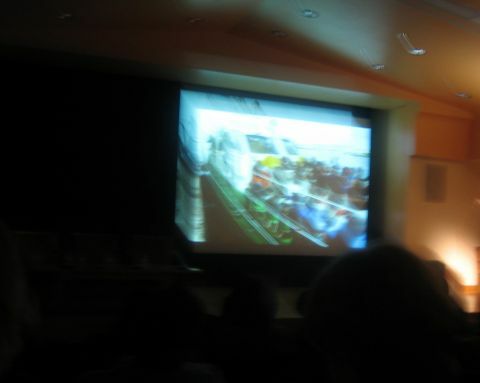 Emilia Telese commenting on the international No-Borders movement, referred to her Dreamland installation project in Western Sahara territory. The aim was to create a stopping place for the Sahari tribe of nomadic people, a permanent place on the map chosen by the elders of the tribe, which the Sahari people can call their own – a dreamland where cultural identity and legends can be recreated. However, the project generates questions on the notion of ownership and on how this new, permanent place would be marked down on the map. Teleste argued that borders are “despicable” and speak about the fear of people. Taking down borders between countries, helps the cause of immigrants. The international migrant and no-borders movements of people on the move reject both the state and its nationalistic borders, while asserting new forms of human rights and global democracy. Migration presents a new identity in transit and a self which is totally uprooted. As Nikos Papastergiadis writes “it is no longer where you are from, or even where you are at, which matters … migration defines itself through its mobility and interactivity with others”. But although the migrant “claims to have access to the rights that are defined by the state … also insists that his identity rests on rights that are above and beyond the state, rejecting any form of integration or assimilation into the mechanisms of the nation-state”. In her book Transpositions:on nomadic ethics, Rosi Braidotti links the concept of migrant identity to a legal status of temporary citizenship, asking for a “dismantling of the us/them binary” and “a disconnection of the three elements of citizenship, nationality and national identity, producing a multicultural minortarian Europe”. As she argues, “the post-nationalistic sense of diasporic, hybrid and nomadic identity can be translated into the political notion of a flexible citizenship, in the framework of the ‘new’ Europe”. However the mobility of migrants entering Europe, does not have a temporary nor a nomadic character and the idea of no borders is in complete contrast to geopolitical reality. While the conference is supporting the abolition of borders, free movement and establishment of migrants in Europe, the geopolitical game imposes further balkanization creating new borders and new countries within EU with the break-up of Yugoslavia, the anticipated demolition of Greece and the division of Cyprus into two countries. In geopolitics, deconstruction and replacement become a subverted form of neo-colonialism, sufficient to cause more than just anxiety. The conference was a paradigm of new coalitions between artists, political activists, curators and art department, post-colonial studies thinkers, determined to play an active role in social change and establish a new ‘order’ of things in Europe. The art produced within this coalition, together with all its awards and scholarships, presenting itself, as Papastergiadis suggests, as a documentary rather than a pure aesthetic art object, acts both as participant and an activist tool. Rosi Braidotti, On flexible citizenship and multiple belongings in her book Transpositions: on nomadic ethics.